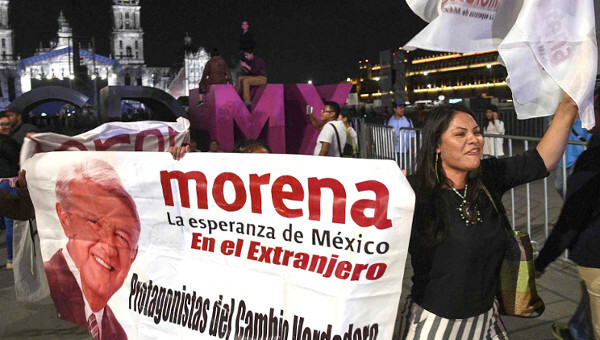 The victory in Mexico’s presidential election of Andrés Manuel López Obrador (AMLO), under the rubric of his relatively new ‘progressive’ Morena party, is both unsurprising and surprising. It’s unsurprising because AMLO had a huge and increasing lead in the opinion polls leading up to polling day. And Mexico’s 88 million voters (out of 127 million people) have now given him the biggest win in post-war election history, with over 53 per cent of the vote. The candidates of the establishment parties were way behind. For the first time, the parties of the elite and the status quo were split over who should be their standard bearer. 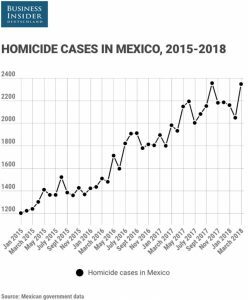 And the sheer anger and frustration at the state of Mexico’s economy and daily life for average citizens has swept AMLO into office. 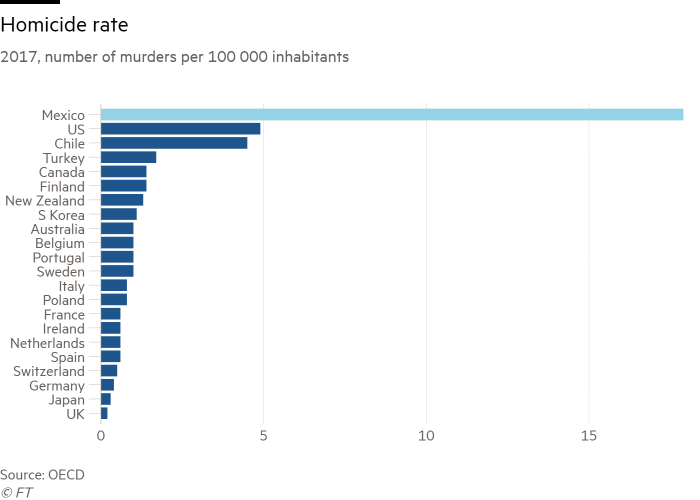 Behind this violence lies the battle of the drug cartels, organized crime and general criminality which is often settled by assassination. The police are either lacking in personnel or backing from the government; or both are in league with the criminals. AMLO says he will stand up for the poor (over 50 million Mexicans are designated as such) first over the rich. And that is the third issue that has led to his election victory. 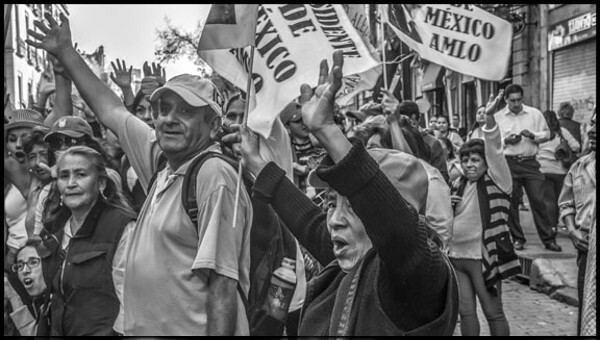 Mexico is one of the most unequal societies in the world in the 21st century – surpassed only by post-apartheid South Africa. 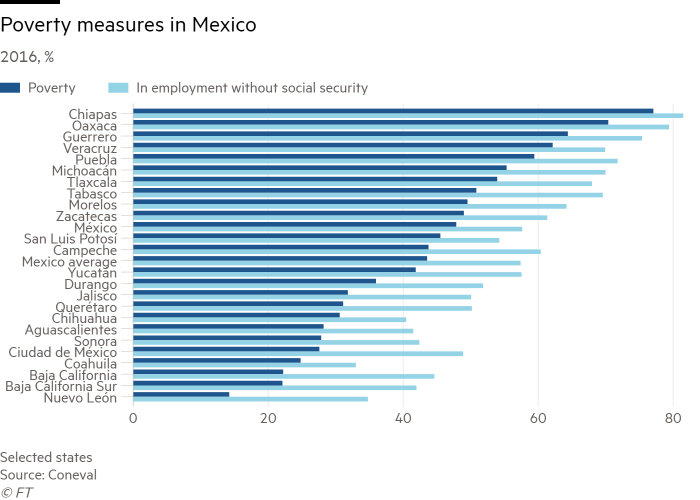 Recently the U.S. Brookings Institution adjusted the standard measure of inequality in a country, the Gini coefficient. The nearer the Gini is to 1, the higher the level of inequality. 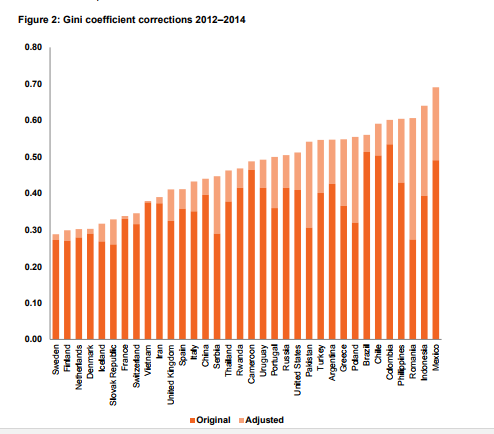 On its new estimates, Mexico’s Gini coefficient for 2014 rises from an already high 0.49 to a mega 0.69, close to that of South Africa, the world’s most unequal country. Contrary to the views of mainstream economics, the 1994 NAFTA trade deal with the U.S. and Canada has not taken the Mexican economy forward. 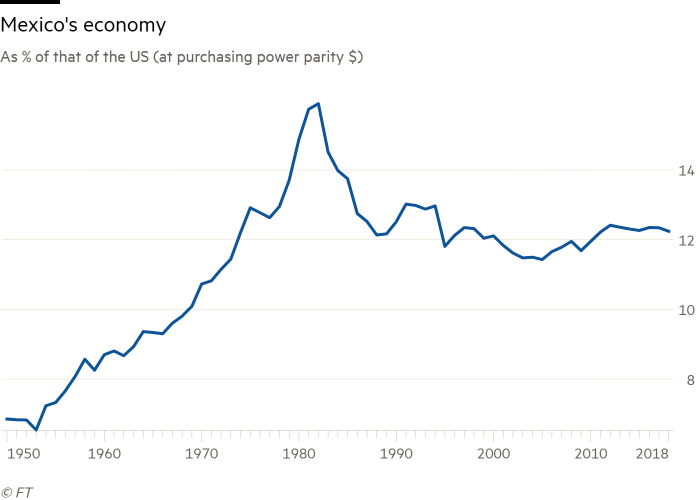 Indeed, whereas the Mexican economy more than doubled to reach 16% of the U.S. output in the 30 years to the mid-1980s, it has declined to 12% since then. 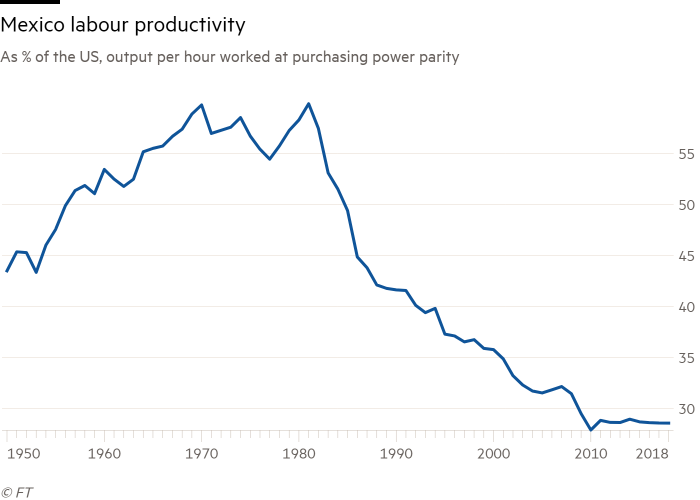 Mexico’s output per hour worked relative to that of the U.S. is near its lowest level since 1950. NAFTA, far from boosting Mexico’s economic performance, increased its dependence on U.S. trade and investment, locked in the neoliberal measures of the 1980s and increased the disparities between the faster-growing U.S. border areas with their special economic zones and the poor southern rural regions. And now U.S. President Trump is insisting on renegotiating to make it even more favourable to the USA! 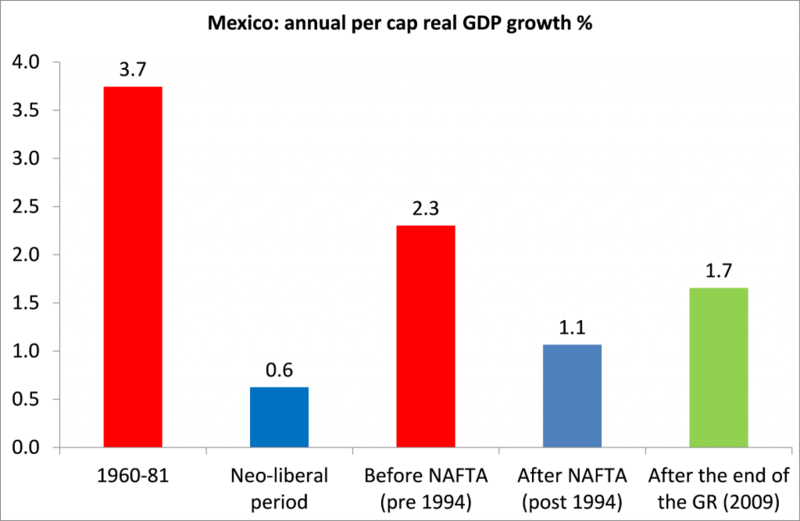 As a result of low profitability and investment, along with the impact of the NAFTA deal, the Mexican economy has basically stagnated. 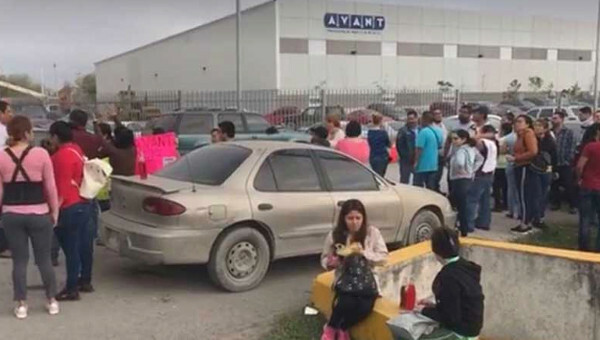 The reason lies with the failure of Mexico’s capitalist sector. 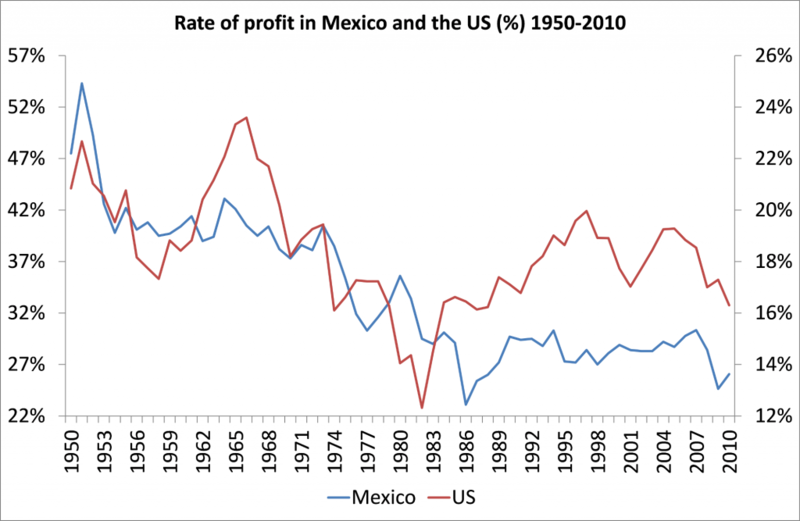 Yes, the ‘neoliberal period’ since the early 1980s, presided over by successive establishment, pro-business Mexican governments, did stem the fall in the profitability of Mexican capital to some extent, but it failed to turn profitability up, as was achieved in most other capitalist economies. 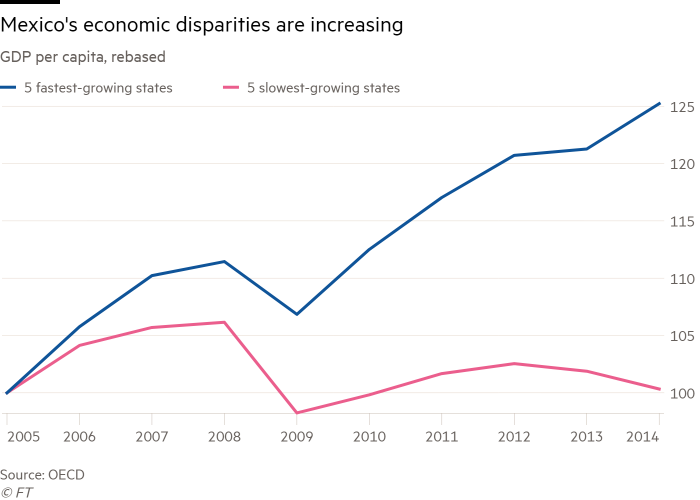 The OECD, the main promoter of neoliberal measures in Mexico, claims that “growth is set to pick up, underpinned by private consumption and exports.” But even the OECD reckons “uncertainty (with Trump) will continue to restrain private investment”. However, “private investment could accelerate if the NAFTA negotiations end favourably.” And it continues to demand “structural reforms” (ie neoliberal measures of government spending cuts and privatizations) “to strengthen the rule of law and improve institutional quality.” (!). 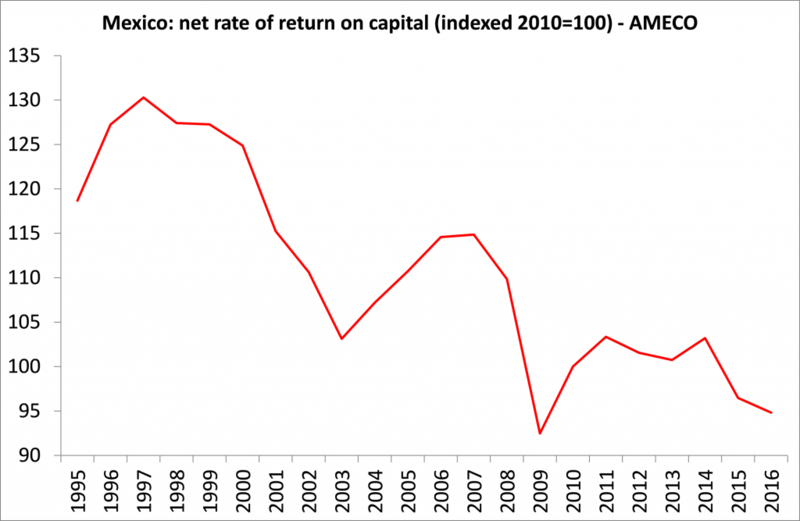 And that is because the profitability of Mexican capital has not recovered since the Great Recession, at least according to the net rate of return on capital data offered by AMECO. Indeed, profitability is still some 18% below the level of 2007 and 28% below the 1997 ‘neoliberal’ peak. AMLO’s programme is fundamentally Keynesian, using public investment to ‘prime the pump’ of private investment and claiming that money saved from reduced corruption will deliver the funding. 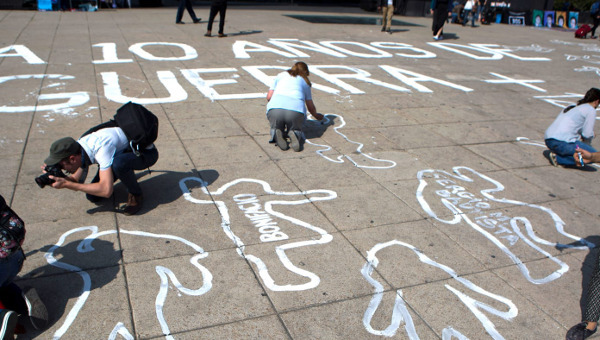 But he is unwilling to reverse the part-privatization of PEMEX, the state oil company or end the proposed new ‘nightmare’ Mexico City airport – only to consider ‘reviewing the contracts’. 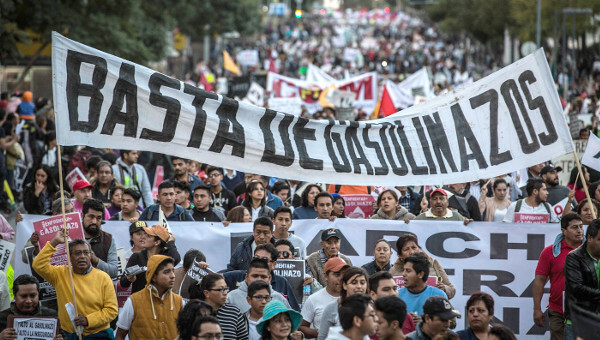 But how can AMLO turn things round on corruption, inequality and violence without control of the banks (mainly foreign), renationalization of PEMEX and taking over the major multi-national operations within Mexico? This article first published on thenextrecession.wordpress.com website.